Medical assisting is a great way to get started on your healthcare career. Make a difference as a Medical Assistant. If you are a people person interested in the field of healthcare, our medical assistant program might be the right choice for you. NMC's Medical Assistant program is designed to give you the knowledge, skills and training you'll need to do well in a variety of healthcare settings. Medical Assistants work in doctor offices and clinics, hospitals and outpatient facilities as well as nursing and residential care facilities. Their responsibilities can range from providing administrative support, scheduling appointments, managing correspondence and bookkeeping to taking patient medical histories, providing patient education and preparing specimens and exam rooms. This is a 12-month certificate program. Students who successfully complete program requirements will be awarded a certificate in Medical Assistant. Students will gain experience in a fully-equipped laboratory prior to entering the clinical setting where they will receive 300 hours of hands-on clinical experience. Graduates are required to take the AAMA exam for professional certification prior to graduation. Students able to transfer their contact hours for block credit, should they decide to continue their education in the Health Studies associate degree completion program. The program includes a total of 930 clock hours. Flexible hours: classes meet Tuesday-Friday 8:30 a.m. - 2:30 p.m. in Terms I, II and III, and 8 a.m. - 5 p.m. in Term IV. The expertise of a healthcare college - this is what we do BEST! Assistance with securing financial aid and scholarships needed to attend. The Bureau of Labor Statistics indicates that the median medical assistant salary in the U.S. in May 2015 was $30,590 per year ($14.71 per hour), with a much faster than average projected growth rate of 23 percent between 2014 and 2024. As of July 1, 2011, the US Department of Education requires colleges to disclose certain information for each financial aid eligible program that prepares students for gainful employment in a recognized occupation. Click the Gainful Employment Disclosure graphic on this page to view information for our most recently completed academic year. We hope you find this information helpful in furthering your knowledge of NMC's program so you can make an informed decision about your educational and career plans. 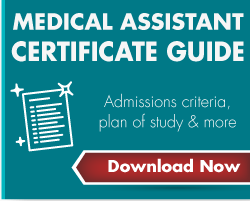 The Medical Assistant Program is accredited by the Commission on Accreditation of Allied Health Education Programs (www.caahep.org) upon the recommendation of the Medical Assisting Education Review Board (MAERB). Commission of Accreditation of Allied Health Programs, 25400 US Highway 19 North, Suite 158, Clearwater, FL 33763. (727) 210-2350. www.caahep.org.